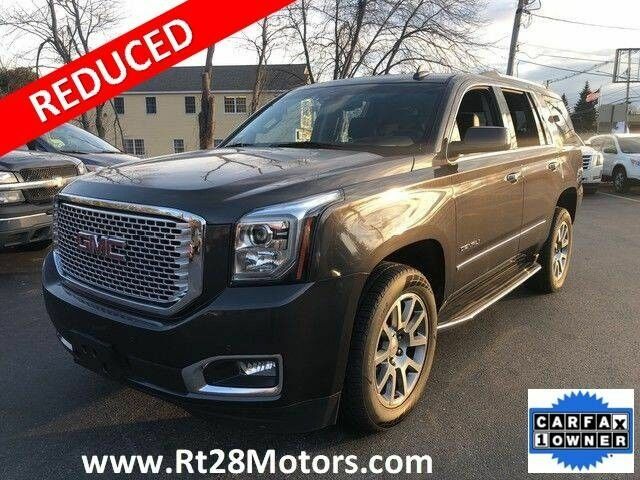 This 2017 GMC Denaili Is all there! This was shipped in from the GMC dealer in south, barely seen any snow and super clean! RECENT ARRIVAL!! 2017 YUKON DENALI!! Rare 6.2 LITER WITH 8 SPEED TRANSMISSION** Iridium Metallic exterior on JET BLACK interior **NAVIGATION**HEATED AND VENTILATED SEATS**REMOTE START**BOSE CENTER-POINT SURROUND SOUND**BLINDSPOT ALERT**HEATED STEERING WHEEL**STEERING WHEEL MOUNTED AUDIO CONTROLS**BLUETOOTH**MAGNETIC RIDE SUSPENSION**POWER LIFTGATE**AND MUCH MORE!! Here at RT28 Motors we strive to make the purchasing process as easy and hassle free as possible. SEATS, SECOND ROW BUCKET, POWER (STD)ENGINE, 6.2L ECOTEC3 V8AUDIO SYSTEM, 8 DIAGONAL COLOR TOUCH SCREEN NAVIGATION WITH INTELLILINK AM/FM/SiriusXMSEATS, FRONT BUCKET WITH PERFORATED LEATHER-APPOINTEDTRANSMISSION, 8-SPEED AUTOMATIC;Audio system feature, Bose Centerpoint Surround Sound premium 10-speaker systemAudio system, 8 Diagonal Color Touch Screen Navigation with IntelliLink AM/FM/SiriusXM stereo with seek-and-scan and digital clock, includes Bluetooth streaming audio for music and select phones; voice-activated technology for radio and phone; and Shop with the ability to browse, select and install apps to your vehicle. You can customize your content with audio, weather and more.